Glass artist Terri Albanese formally trained at the Columbus College of Art and Design, earning a BFA in graphic design. After finding inspiration in the ancient mosaics of Italy, Terri decided to further her education at the Miami Mosaic Academy in Florida. Incorporating both her artistic and artisanal training, Terri embarked on a creative project of painting with glass. Her pieces are both aesthetically and conceptually driven, with an emphasis on narrative, and they are created to evoke emotions of joy, peace, hope and encouragement. Terri’s glass paintings are created one piece at a time – taking a rigid, sharp and unforgiving material like glass and transforming it into a refined and inspirational piece of art. With precision she hand cuts the glass into long thin strips, which becomes her palette. She then places the pieces (tesserae) side-by-side, building colors and textures similar to a painter with brushstrokes. Her pieces are designed to view from a distance and slowly pull you in. What Terri finds intriguing is when a person feels compelled to touch her glass paintings, made from cut glass. The texture found in her glass, made in the Laurel Highlands of Pennsylvania, pulls you in and invites you to gently guide your fingertips over the glass paintings. Terri encourages you to touch her work since it allows you to be pulled further into the art. Terri’s personal experiences, faith, love of nature and collaboration with others inspire her, as her paintings are created for those who want to reveal something about themselves and their love for original art. From seeing the beauty in the world and all its wonders – Terri’s art celebrates life. 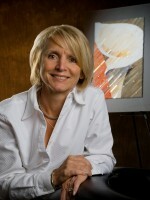 Terri’s paintings can be found in personal and corporate collections throughout the United States, Hong Kong and Israel.